On almost any given day, you can sip your coffee and read in the newspaper about people who have done irrational things and have ruined or lost their lives. In the 02/10/2011 issue of the San Antonio Express-News is an article about a "brutal stabbing." According to the story by reporter Craig Kapitan, one morning Jesus Cruz (34) got angry over thoughts of unjustified jealousy. So he left his job as a ranch hand, returned home and attacked his wife Rosa Hernandez (60) with a steak knife. He stabbed her 15 times until the knife broke, and then he tried to suffocate her with a pillow. 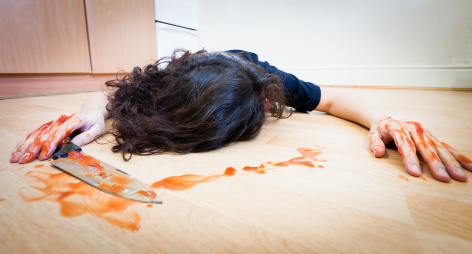 She escaped when he returned to the kitchen to get another knife. She collapsed outside and witnesses called 911. She survived to testify and now Jesus faces a possible life sentence. Whenever I read one of these reports, I always ask, What was going on in this person's mind? Why did he let his anger escalate out of control? Why didn't reason kick in at some point? Why didn't he ponder the consequences? Why didn't he consider other courses of action instead of throwing his life away for no good reason? The truth is, I can't imagine this mindset. His mental processes are too different from mine. I would not have reacted this way. I would have wanted to confront my wife, discuss it, and discover the truth. Then reconcile or consider my options. The answer - for me - is that Jesus, when he was a young man between the ages of 12 and 22, when the critical thinking part of his brain was developing, had a miserable "teen journey," in which he never received the kind of helpful parenting and coaching when confused and disturbed by his experience as a teenager. He made a lot of wrong choices and by the time he was a man, he had failed to construct even a minimal foundation of neurons in his pre-frontal lobes. Instead of critical thinking skills, the patterns he ingrained had to do with reacting emotionally, much the same way a child would. Only he's not a child. He's a fully grown man with a knife and a child's brain. This is why I consider the teen journey - the most important period of brain development in a person's life - a perilous experience and a turning point in a person's life. And why I believe parents, teachers, coaches, counselors and other youth mentors need to know more about it. Sounds plausible to me, Denny. I find that anger is usually a fear response in disguise. Maybe it was his fear of losing her, but what a shame to express it that way. Interesting perspective. It is an "irrational" response and we who reason and write about such things may never have experienced the degree to which emotion can take hold of a person. I wonder if much medical research is being done on brain activity and perhaps deficits that develop due to poor parenting in body chemistry. You know this was not just a moment of rage. This was not the first time he had hurt his wife. Fits of unjustified jealousy like this are not once-offs. Something is broken in this person. Deeply broken.